* Tinnitus is a complex condition, where the cause and experience are highly subjective, and the results of the patch treatment may vary from person to person. Antinitus is a non-invasive medical device that does not contain any harmful chemicals. *The effects may vary, according to clinical studies 30-50% experience relief. Read more. A treatment with Antinitus does not have to affect your daily life. All you have to think about is to replace the patch once a day. The patch is placed locally on the hairless skin on the projecting portion of the skull behind the ear (see instructions for use). Clean the skin area before applying a new patch for the best possible result. • The intention of the Antinitus treatment is to provide long-term relief from tinnitus or even permanently, but the result is highly individual and can vary a great deal. • Some people may experience an increase in tinnitus (ringing in the ears) at the start of the treatment, often the first few days. This is not a cause for concern, it only means that your body is sensing an effect from the patch. • For some people, relief from the tinnitus symptoms may come days or weeks after the completion of treatment. • It may be worthwhile trying a new 3-week course of treatment one month after the last patch if the first course did not have a positive effect. There are individual variations in regard of susceptibility to the effect. • Unfortunately some people are not helped by the patch. No treatment method is 100% effective. *Disclaimer: Antinitus Patches can ease tinnitus symptoms and according to clinical studies 30-50% of Antinitus users experienced relief from their tinnitus symptoms. The effects can vary from one individual to the next. Read more. Antinitus is a method for relieving discomfort from tinnitus (ringing in the ears), developed and produced in Sweden after many years of research and studies. Antinitus is easy to use, with a painless application. Antinitus is made of materials that are gentle to the skin. Tinnitus is a common problem that affects approximately 10 to 15% of the population. Tinnitus is a sensation of sound in one or both ears, or inside the head, in the absence of a corresponding external sound source. Read the instructions carefully before using Antinitus. If you have questions or concerns regarding your condition, you should consult your health care provider. How exactly does the Antinitus patch work? Antinitus is a patch designed to reduce discomfort from tinnitus. 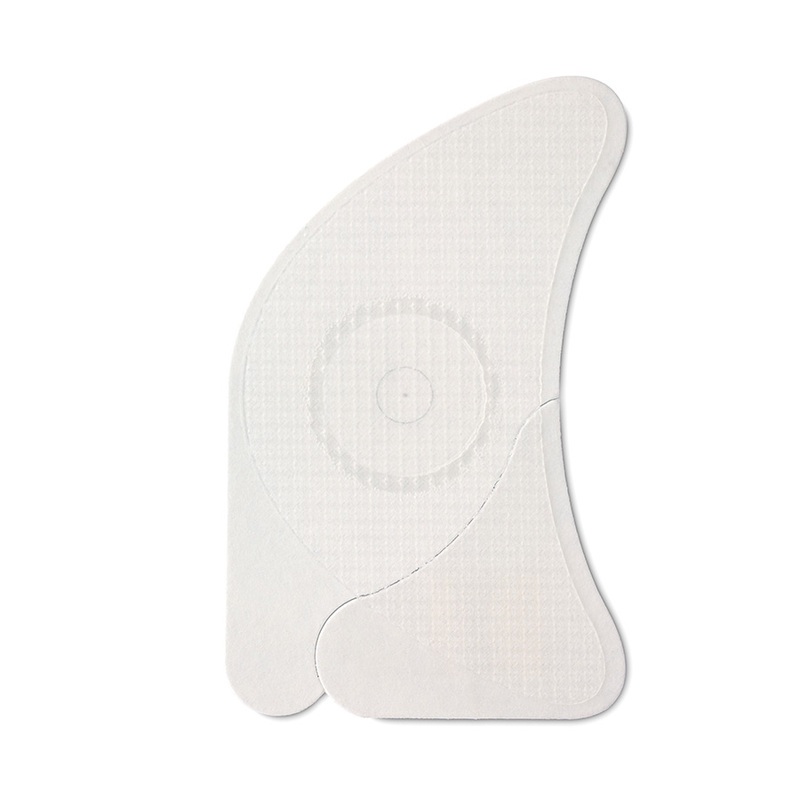 The patch contains a unique raster – a patented lens that creates an organized signal, which is expected to, directly or indirectly, regulate nerve functions in the auditory system to relieve discomfort from tinnitus. Antinitus is used for relieving discomfort from tinnitus in adults. Antinitus patches are a disposable product that must be replaced daily to achieve the best result. Apply the Antinitus patch as described in the APPLICATION instructions. The patch must be replaced daily and worn for 24 hours. Do not use the Antinitus patch for more than 21 consecutive days. Use only one patch at a time. Apply the patch behind the ear in which you are experiencing tinnitus symptoms. If you have problems with both ears, apply the patch behind the ear with the more serious symptoms. It is a good idea to replace the patch at around the same time everyday, e.g. after breakfast or after taking a shower, to help you remember to apply a new Antinitus patch. Once the patch has been opened it must be used immediately and replaced daily. The patch must not be reused and the effect cannot be guaranteed. Since tinnitus manifests itself differently in different people, the effect may vary. One experience from the studies is that the alleviating effects increase after the completion of the treatment. You can live normally during the treatment and do not have to make any changes with regard to, for example, exercise, spending time out or indoors or the way you wear your hair. Does Antinitus work for everybody? The effect of Antinitus varies between individuals and it does not work for everyone. Antinitus Patches can ease tinnitus symptoms and according to clinical studies 30-50% of Antinitus users experienced relief from their tinnitus symptoms. Have any clinical studies been carried out on Antinitus? Three clinical studies of Antinitus® effect on tinnitus has been completed. These showed that many of the patients included in either study experienced relief of symptoms, or the symptoms completely ceased after treatment. Another experience from the studies was that the soothing effect seems to accelerate after the treatment period. Some of those who were in our studies experienced no change at all, and some people experienced improvement of some kind. Antinitus is safe to use. What do you mean by relief from tinnitus? Tinnitus is a subjective experience and is measured through estimates of the person affected. Relief may mean different things for different people, but in the end it is the person affected who decides. For some people, relief is a lower tone or strength of their tinnitus, for others, periods of silence might be the important thing. When can I expect relief during treatment? The result is highly individual. Most people who experience relief do so during the 3-week course of Antinitus, others get relief days or weeks after the treatment and some experience no relief at all. The pitch increases at the start of the treatment, what should I do? Tinnitus symptoms may increase at the start of treatment, but this normally subsides after a few days. Can I use Antinitus together with my medication? Yes, Antinitus has no known effect on pharmaceutical drugs and can be used unless a physician has advised against it. What is the recommended treatment cycle for Antinitus? The recommended treatment cycle is 3 weeks. If the tinnitus symptoms increase/return after a round of treatment, the use of Antinitus may be resumed four weeks after the end of the previous treatment cycle. What does a package of Antinitus contain? The package contains an inner box of 21 Antinitus patches and instructions for use. Where do I place the Antinitus patch? The patch must be placed locally at the cranial base behind the ear associated with the more severe tinnitus symptoms. If I have tinnitus in both ears, should I wear a patch on each ear? 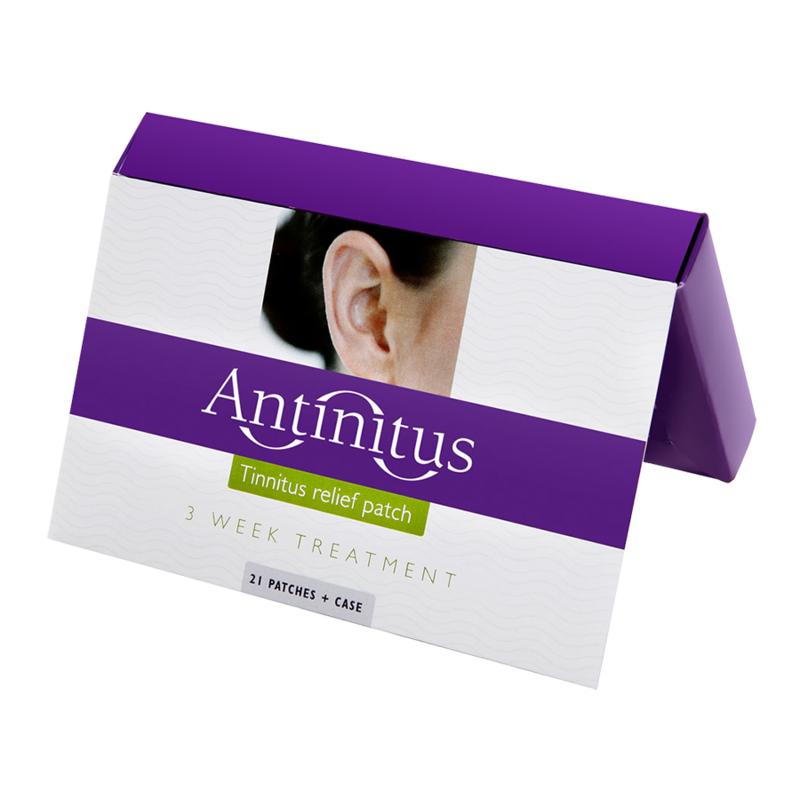 Apply the Antinitus patch behind the ear in which you are experiencing tinnitus. If you experience problems in both ears, you should apply the patch behind the ear with the more serious symptoms. Does the Antinitus treatment effect continue after use of the product has been discontinued? If so, for how long? It is important to complete the treatment for 3 weeks as the clinical studies and the effect of these are based on this treatment duration. Does the patch work for all kinds of tinnitus? According to the clinical studies, a wide range of tinnitus patients have been treated and positive effects have been demonstrated. Can the patches be used to prevent tinnitus? There are no studies or clinical experience yet in this particular area, so this is not recommended at this point in time. Can the patches be used to prevent hearing impairment? No, the patch should not be used in this manner. It is very important to protect one’s ears from harmful sounds and noise in order not to develop, or exacerbate, tinnitus. I have recently been exposed to loud noises, which has resulted in howling sound in my ears. Should I use Antinitus? This is a protest from the ears when you have been exposed to a far too high volume of sound. Tinnitus (the howling) usually wears off after at few days, but remember to protect your ears from loud noises in the future. Antinitus is not intended for temporary tinnitus, it should only be used if the tinnitus persists for a long time. Does the patch work for hyperacusis, so called hypersensitive hearing? No studies have been carried out in this area, but it will be examined in future studies as experience indicates that there is a positive effect. Can the patch be used in conjunction with other treatment of tinnitus, such as a noise-blocking device, CBT or TRT? There are no clinical studies about this, but at the same time there is nothing that contradicts the use of Antinitus in these cases. Consult your physician, therapist or audiologist. Can the product be worn at the same time as a hearing aid? Antinitus has no known effect on hearing aids and can be used unless a physician has advised against it. On which markets is the Antinitus patch approved? Antinitus is CE marked and approved/registered as a class 1 medical device according to EU Directive 93/42 /EEC and therefore approved for the European market. Antinitus is also approved and registered in Canada, Australia and New Zealand. Is the Antinitus patch approved in the USA? We have not yet applied for registration of our ANTINITUS medical device with the FDA and, therefore, the product is not yet approved for the US market. However, we are engaged in the relevant clinical research to support an application for FDA approval and intend to apply for FDA approval in the USA as soon as feasible. Can I use the product if I am pregnant or nursing? The use of Antinitus is not recommended during pregnancy or nursing as no clinical studies have been conducted on this group. Can children use the product? Antinitus has not been studied in children and must therefore not be used for the relief of discomfort from tinnitus in children below the age of 18 unless prescribed by a physician. Does Antinitus work on Menière’s disease? Antinitus may have an effect on tinnitus associated with Menière’s disease, but this has not yet been specifically studied. Does the patch work for sudden hearing loss/deafness and tinnitus? In such an event, you should seek medical care immediately. Consult your physician if you have received treatment for this condition and are interested in trying Antinitus. Must the patch be replaced on a regular basis? If that is the case, why? Antinitus AB’s risk assessment shows that the main potential risk associated with using the Antinitus patch is getting foreign objects trapped underneath the patch, thus causing irritation. To reduce this risk, it is recommended that the patch is replaced daily and that the skin area is cleaned and dried thoroughly. How long can the patch stay on and still have an effect? The patch has been designed and studied for daily replacement and has an effect as long as it is applied on the skin. Does the patch only work in the local affected area behind the ear? The effect of the patch has only been studied when placed behind the ear. Is the product equally effective on all skin types – race/color, age/elasticity? The product works independently of skin type since the effect takes place on the skin moisture on the surface of the epidermis. What do I do if the skin becomes irritated underneath the patch? If the skin becomes irritated you should stop using Antinitus until the irritation has ceased. Treatment can be resumed as soon as the irritation has disappeared. Can I bathe and/or shower while wearing the patch? The Antinitus patch is water resistant, but like any other patch it may loosen to some extent in contact with water. Try to replace the patch after showering or bathing every day. Has any animal testing been carried out in conjunction with Antinitus tests? No animal testing has been carried out. How should Antinitus patches be stored? Store the patches in their box in a dry place at room temperature (18 °C to 25 °C). Keep away from direct sunlight. The expiration date is printed on the package. Once the patch has been opened it must be used immediately and replaced daily. Used Antinitus patches can be discarded with normal household waste or as combustible waste. The box and the instructions for use can be separated as waste paper after the treatment period. Antinitus® is a method for relieving discomfort from tinnitus (ringing in the ears), developed and produced in Sweden after many years of research and studies. Antinitus® is easy to use, with a painless application process. Antinitus® is made of materials that are gentle to the skin. Read the instructions carefully before using Antinitus®. If you have questions or concerns regarding your condition, you should consult your health care provider. Apply the Antinitus patch® behind the ear in which you are experiencing tinnitus symptoms. If you have problems with both ears, apply the patch behind the ear with the more serious symptoms. Clean the skin behind the ear carefully with soap and water. Dry thoroughly before applying the Antinitus patch® as it will not stick to oily or damp skin. Check the packaging before use to ensure that the patch is not damaged. Open as illustrated. Peel off the protective film from the back of the patch as illustrated. 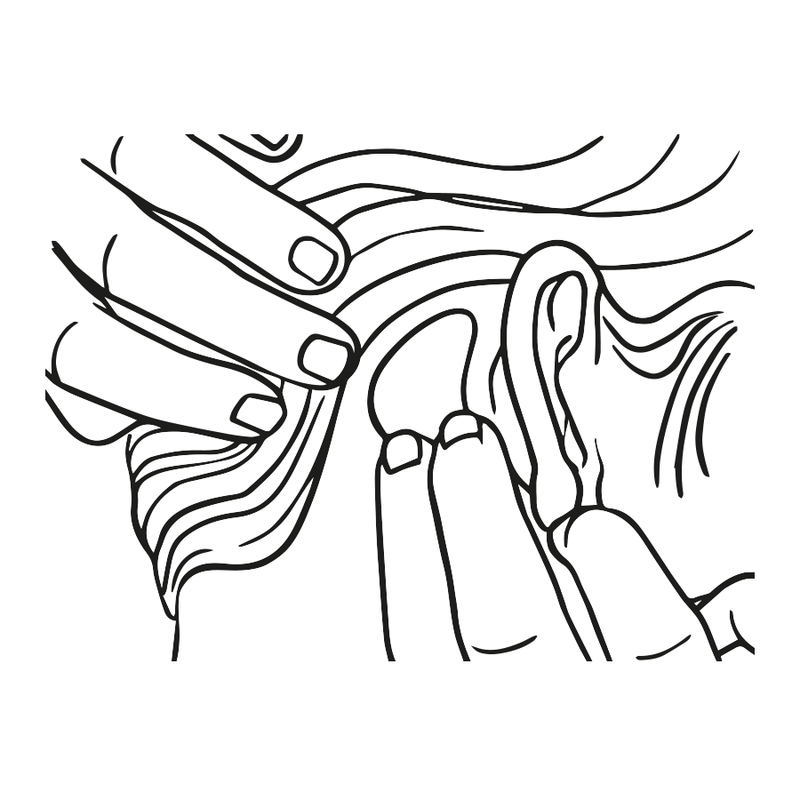 Keep long, flowing hair out of the way with one hand and apply the Antinitus patch® behind the ear with the other, as illustrated. Press carefully on the patch to ensure that it sticks well to the skin. Clean the skin with soap and water after removing the Antinitus patch®. Follow the instructions in figures 1–4 when applying a new Antinitus patch®. The package contains an inner box of 21 Antinitus patches® and instructions for use. What is Antinitus used for? Antinitus® is used for relieving discomfort from tinnitus in adults. Antinitus patches® are a disposable product that must be replaced every day to achieve the best result. Antinitus® is a patch designed to reduce discomfort from tinnitus. The patch contains a unique raster/lens that creates an organized signal, which is expected to, directly or indirectly, regulate nerve functions in the auditory system to relieve discomfort from tinnitus. Clinical studies and clinical experience show that Antinitus® can relieve the symptoms of tinnitus and that Antinitus® is very safe to use. – If you suffer from tinnitus and unilateral hearing impairment (not the same level of hearing in both ears) with no known cause, or if you have pulsating tinnitus (like your pulse) or other ear symptoms, you should consult a physician before using Antinitus®. – Antinitus® is a method for the relief of discomfort from tinnitus only. – Antinitus® has not been studied in children and must therefore not be used for the relief of discomfort from tinnitus in children below the age of 18 unless prescribed by a physician. – Antinitus® must not be used on damaged or irritated skin. – If the skin becomes irritated you must discontinue the use of Antinitus® until the irritation has ceased. Treatment can be resumed as soon as the irritation has disappeared. – If you experience an allergic reaction while using Antinitus® you must discontinue your use of the product and contact a physician. – Antinitus® must not be used in combination with other tinnitus treatments unless prescribed by a physician. –Antinitus® has no known effect on pharmaceutical drugs and can be used unless a physician has advised against it. –Antinitus® has no known effect on hearing aids and can be used unless a physician has advised against it. – Tinnitus symptoms may increase at the start of treatment, but this normally subsides after a few days. – The use of Antinitus® is not recommended during pregnancy or nursing as no clinical studies have been conducted on this group. – The effect of Antinitus® varies between individuals and it does not work for everyone. – Do not use damaged Antinitus patches® or patches from a damaged package. – The patches must not be reused. – Must be kept out of reach of children. – Antinitus® is a CE marked medical device. Apply the Antinitus patch® as described in the APPLICATION instructions. The patch must be replaced daily and worn for 24 hours. Do not use the Antinitus patch® for more than 21 consecutive days. Use only one patch at a time. Apply the patch behind the ear in which you are experiencing tinnitus symptoms. If you have problems with both ears, apply the patch behind the ear with the more serious symptoms. It is a good idea to replace the patch at around the same time everyday, e.g. after breakfast or after taking a shower, to help you remember to apply a new Antinitus patch®. Once the patch has been opened it must be used immediately and replaced daily. The patch must not be reused and the effect cannot be guaranteed. Since tinnitus manifests itself differently in different people, the effect may vary. One experience from the studies is that the alleviating effects increase after the completion of the treatment. You can live normally during the treatment and do not have to make any changes with regard to, for example, exercise, spending time out or indoors or the way you wear your hair. If the tinnitus symptoms increase/return after a round of treatment, the use of Antinitus® may be resumed four weeks after the end of the previous treatment cycle. Store the patches in their box in a dry place at room temperature (18 °C to 25 °C). Keep away from direct sunlight. The expiration date is printed on the package. Once the patch has been opened it must be used immediately and replaced daily. Used Antinitus patches® can be discarded with normal household waste or as combustible waste. The box and the instructions for use can be separated as waste paper after the treatment period. These customer reviews are based on the experiences of some of our customers and may vary from one person to another. “Thank goodness for this product. I have ringing, well actually it’s like morse code playing, in one ear. After trying many pills and potions to get relief I came across Antinitus patches online and decided to try. After using this product my problem has reduced considerably and at present I’m noise free. “Dear Antinitus AB. Since having a stroke two years ago, I’ve been left with tinnitus, or ringing in my ears. Nothing has helped up to this point. I tried your Antinitus Ear Patches since I was willing to try anything for an attempt at relief. One month later, I find that the ringing is astonishingly diminished, almost non existent. “When I first developed tinnitus suddenly in November 2009 in my right ear the level of the noise was very low and intrusive and of course very distressing. I spent money on healers and various people who claimed they could help. Having said that, my tinnitus was diagnosed as a stress related condition by an ENT specialist and my hearing was diagnosed as normal. When I saw the patches advertised on Facebook I decided it was a last resort as nothing else had helped me. After using one course of patches I used another one after a couple of weeks, during this time I noticed for the first time that there had been occasions when I hadn’t even noticed the ringing in my right ear when shopping or in a noisy environment. Before using the patches my tinnitus was so loud I’d been aware of it in Heathrow airport over all the noise of a big airport when flying to Australia in 2010. So using the patches has definitely reduced the intensity to a more acceptable level and sometimes completely forgotten for short periods of time. The other thing I would like to add, is that the support team at Antinitus have been amazing, always at the other end of an email, asking questions, advising and being very supportive. They don’t claim to cure this distressing condition, but what they do is to advise, support and in my own case reduce the loud ringing in my ear. It might not work for everyone, but in my own case the patches have given me relief and emotional support. This is my second treatment and Antinitus has again begun to relieve my very severe tinnitus. This time it took longer than the first (when I stupidly did not renew my order) – 6 weeks this time to begin working but I did not give up and I was eventually suddenly rewarded again by a massive reduction of the ringing in my right ear. Now I am sleeping 8 hours per night rather than the 4 hours max I have slept for the last 30 years! After trying the patches I do not have too much ‘noise/buzzing’ in my ear. While wearing the patches it was nice to have some relief from the ‘noise’. I am 81 years young and have had tinnitus for many years. My father also had tinnitus for many years. He was musical and could hear the tinnitus by musical decimals. I can not, but my tinnitus was two tones. After using this incredible product I have only one quieter lower pitch sound. It’s now been four weeks since I last used a patch and it has stayed the same, one pitch, better than the two tone. So yes I will try the patches again to see if even more control can be gained. If not it’s still far better than before I started the course . Thanks for the relief I have received so far. It has been a great improvement, almost no tinnitus for over 12 months, unfortunately it has come back with a vengeance the last couple of weeks, I am 88 years young, I have reordered an other course and I hope it will help. Since the treatment the ringing is not as loud and it has improved. Now when I am in a public house I can hear the conversation with my friends. At present I hear only faint noises every now and again, but they don’t disturb me, and the nights are completely quiet for the moment. If a ringing sound does occur, I listen to meditative music using headphones.